Born on May 15, 1866, George H. Wanton was born and raised in Paterson, New Jersey. Sgt. Wanton joined the U.S. Navy in 1884 and served for four years before joining the U.S. Army in 1889. 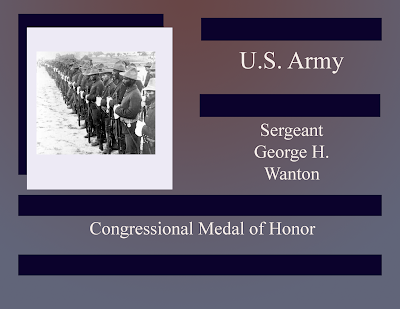 He was assigned to Troop M of the 10th Cavalry Regiment during the Battle of Tayacoba of the Spanish American war and earned a Congressional Medal of Honor for his actions during the rescue of a landing party (with Dennis Bell, William Thompkins, and Fritz Lee). Sgt. Wanton also attempted to retrieve the body of Captain Manuel Nunez, but the operation was considered too unsafe. In November of 1921, he served as an honorary pallbearer for the Unknown Soldier and finished the rest of his career as quartermaster. retiring from service in 1925.